Contact Information, including email address, residential address, cell phone number etc. Demographic Information, such as postal code, zip code etc. Cheezyn.pk understands that your personal details are confidential. Thus, your information is restricted within the organization. It will not be traded to third parties or used for any external purpose. Information may be collected to improve our products and services. This information may be used by us to contact you for market research purposes. This contact may be done through mails, phone or emails. It is ensured that your personal information will not be revealed or shared with anyone outside Cheezyn.pk. The only information collected by us is the one allowed by the user. 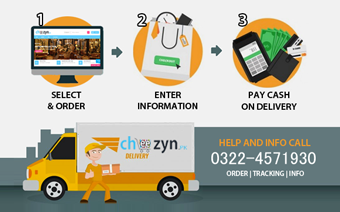 Cheezyn.pk keeps user’s information till it is needed for primary purposes, like online shopping. We ensure that the information gathered from our customers is safely stored and protected by the latest software’s preventing unauthorized access.